Identity is a wildly elastic thing in the world of pop stardom, and it always has been. As human objects of fantasy, pop stars provide a way for their fans to project their maddest dreams of transformation. Eleanora Fagan escapes a torturous childhood, slips a gardenia in her hair, and becomes Billie Holiday. Robert Zimmerman shakes off his middle-class Jewish background, takes on a rockabilly persona and starts singing under the name of Elston Gunn, only to change his mind and go with a third identity, Bob Dylan. Farrokh Bulsara turns into Freddie Mercury. Onika Maraj becomes Nicki Minaj. Old story, new names—but, lately, there’s a twist. In more and more instances, it seems to me, pop singers are not simply abandoning their inherited self for a new, constructed self; they’re giving up the very idea of the self in favor of an implied group identity, taking on stage names that make them sound not like singers, but like bands. When I posted the video of the song “Oblivion” here, a few weeks ago, I called a music-head colleague of mine and asked him what he thought of Grimes, who wrote and recorded the tune and is featured in the video. “I think they’re overrated,” said my friend, without knowing a thing about what he was talking about. I don’t blame him for confusing the professional name of Claire Boucher, the Canadian singer-songwriter, with the name of a band. (Though Grimes could easily be a performer’s surname, as it is for the English actor Tammy.) 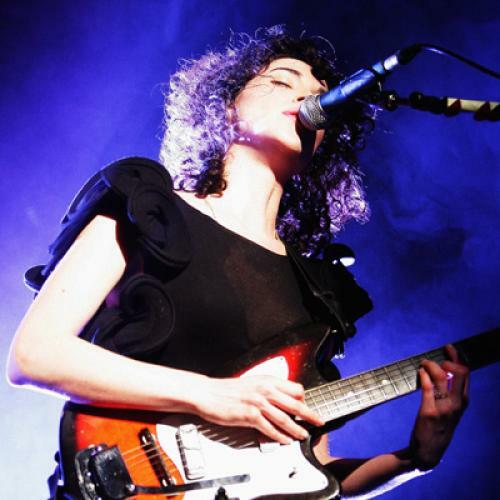 Grimes is sometimes compared with St. Vincent, which is the adopted name of the New York-based singer-songwriter Annie Clark, and St. Vincent sounds something like a band name, too. Both of them are carrying on a tradition established in indie rock a few years ago by Iron and Wine (Sam Beam), Bon Iver (Justin Vernon), and Nine Inch Nails (Trent Reznor), the last two of which (or whom) record as one-man-bands but tour under the same name with other musicians. This is a tradition with links to hip-hop, where professional identities have always had the quality of street names and graffiti tags. Now, the practice is blossoming in pop and rock, where, over the past few months, I’ve heard new music by a wave of emerging solo artists: Secondhand Serenade (John Vesely), Anchors (David Black), Field Report (Chris Porterfield), and Dirty Beaches (Alex Zhang Hungtai).